•	The 1987 INF Treaty eliminated all ground-launched missiles with a range between 500 and 5500 kilometres, including both cruise and ballistic missiles. •	The 1990 Treaty on Conventional Armed Forces in Europe (CFE Treaty) capped at equal levels the number of heavy weapons deployed between the Atlantic and the Urals by members of both the North Atlantic Treaty Organization (NATO) and the Warsaw Treaty Organization (WTO). •	The 1991 Treaty on the Reduction and Limitation of Strategic Offensive Arms (START I) reduced the number of strategic nuclear weapons; further cuts were agreed in 2002 and again in 2010 in the Treaty on Measures for the Further Reduction and Limitation of Strategic Offensive Arms (New START). •	The 1991 Presidential Nuclear Initiatives (PNIs) were parallel, unilateral but agreed actions by both the Soviet Union and the USA to eliminate short-range tactical nuclear weapons, of which thousands existed. Taken together, the nuclear measures—the INF Treaty, START I and the PNIs—had a major impact (see figure 1). Source: Kristensen, H. M. and Norris, R. S., ‘Status of world nuclear forces’, Federation of American Scientists, 2018. The fastest pace of reduction was in the 1990s. A deceleration began just before the new century started, and there has been a further easing of the pace in the past six years. Nevertheless, year by year, the number continues to fall. By the start of 2018 the global total of nuclear weapons was 14 700 compared with an all-time high of some 70 000 in the mid-1980s. While nuclear weapons are more capable in many ways than before, the reduction is, nonetheless, both large and significant. Trump’s announcement brings a process that has been going on for several years towards its conclusion. The USA declared Russia to be violating the INF Treaty in July 2014. That was during the Obama administration. Thus, the allegation that Russia has breached the INF Treaty is, in other words, not new. This year the USA’s NATO allies also aligned themselves with the US accusation, albeit somewhat guardedly (note the careful wording in paragraph 46 of the July Summit Declaration). Russia rejects the US accusation. 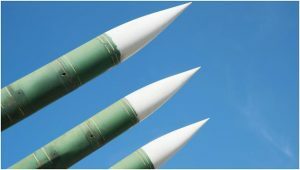 It makes the counter-charge that the USA has itself violated the INF Treaty in three ways: first by using missiles banned under the treaty for target practice; second by deploying some drones that are effectively cruise missiles; and third by taking a maritime missile defence system and basing it on land (Aegis Ashore) although its launch tubes could, the Russians say, be used for intermediate range missiles. Naturally, the USA rejects these charges. A further Russian criticism of the USA over the INF Treaty is that, if the USA wanted to discuss alleged non-compliance, it should have used the treaty’s Special Verification Commission before going public. This was designed specifically to address questions about each side’s compliance. The Commission did not meet between 2003 and November 2016, and it was during that 13-year interval that US concerns about Russian cruise missiles emerged. •	Russia claims that the USA is technically violating New START because some US launchers have been converted to non-nuclear use in a way that is not visible to Russia. As a result, Russia cannot verify them in the way the treaty says it must be able to. The Russian Government’s position is that until this is resolved, it is not possible to start work on prolonging New START, despite its imminent expiry date. The risk of a return to nuclear weapon build-ups by both Russia and the USA is clear. With it, the degree of safety gained with the end of the cold war and enjoyed since then is at risk of being lost. Aware of the well-earned reputation for springing surprises that the Russian and US presidents both have, there may be more developments in one direction or another in the coming weeks or even days.